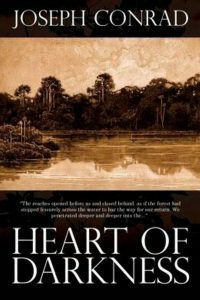 Heart of Darkness follows Marlow, a knowledge-seeking sailor, as he embarks up the Congo River to join up with Kurtz, alleged to be an idealistic man with many talents. Marlow assumes a job as a riverboat captain for a Belgian organization with interests in the Congo known simply as the Company. During his journey to Africa, and later to the Congo, Marlow faces tremendous inefficiencies and unimaginable brutality in the Company’s stations. The local inhabitants of the area have been forced into servitude for the Company, and they face great abuse at the hands of the agents of the Company. The nastiness and squalor of imperial business contrasts vividly with the impassive and majestic jungle that borders the settlements of the white man. Marlow lands at Central Station, managed by an unpleasant and conspiratorial individual. He soon learns that his steamship has sank and then spends the next several months waiting for a shipment of parts so that it can be repaired. During this time, he develops a keen interest in Kurtz. The manager, and his favorite employee, a brickmaker, appear to view Kurtz as a threat to their position with the Company. Kurtz is reputed to be ill, making the stall in fixing the ship all the more costly. The parts to repair the ship eventually arrive and he, along with the manager and a few cohorts – including a band of cannibals – begin a difficult trek up the river. The dense jungle surroundings and the deafening silence cause those aboard the ship to become slightly agitated, and the occasional sight of native villages or the sound of beating drums cause the Company agents to panic. Marlow and the crew happen upon a hut with a stack of firewood. A note indicates that the wood is for their use, but that they should approach with caution. Soon after the steamer begins to take on the firewood, it is surrounded by a thick fog. When the fog dissipates, it becomes obvious that the ship is under attack by a band of natives firing arrows from deep in the forest. An African helmsman is murdered before Marlow is able to scare away the native attackers with the ship’s steam whistle. Eventually, Marlow and the men find their way to Kurtz’s inner station, fully prepared to find him deceased. Instead, they are met by a crazed Russian trader, who indicates that he is the one who left the wood. The Russian believes that Kurtz has enlightened him and that he is not able to be subjected to the same moral judgement as those around him. Evidentially, Kurtz has established himself as a godly figure in the eyes of the natives and has ventured out on brutal raids in search of ivory. The vast collection of severed heads placed a top of fence posts around the station are said to be a testament of his preferred methods. The Company men bring Kurtz out of the station on a stretcher, where he is then surrounded by a large group of native warriors. After some discussion with Kurtz they disappear back into the woods. The manager brings a deathly ill Kurtz onto the steamer. A stunningly beautiful native woman, reputed to be the mistress of Kurtz, stares at the ship from the shoreline. The Russian discloses that she is involved with Kurtz and that she has caused problems before. He then shares with Marlow, after swearing him to secrecy, that Kurtz had been the one who ordered the attack on the steamer in hopes of making them believe that he had died so that they would turn around and abandon their plans. The Russian than departs by canoe. Kurtz disappears under the cloak of night, but is soon found crawling towards the native camp. Marlow pleads with him to return to the ship and the set sail the following morning. Kurtz’s health is in steady decline. Marlow lends and understanding ear to Kurtz while he steers the ship, and Kurtz presents him with a selection of personal documents, including a portfolio on civilizing the savages which ends in a very specific message – Exterminate the brutes! The steamer breaks down, causing the crew to need to stop to repair the ship. Kurtz dies while muttering ‘The horror! The horror!’ Marlow is confused by these final words. He too soon falls ill, and barely misses death. Soon he returns back to Europe, where he meets the intended fiancé of Kurtz, who is still in mourning more than a year later. She asks what her beloved’s final words were. In a bid to bring peace to her shattered heart, Marlow lies and tells her that his last words were her name.